Rosie the Riveter is perhaps most recognized symbol of wartime aircraft production, having come about in World War II (although women also built trucks, tanks, guns, sewed uniforms, made boots,...). She is also symbolic of women entering the workforce en masse. After WWII, many women went back to being housewives and raising families with war-weary servicemen looking to resume peaceful lives. The respite didn't last long, as the Korean conflict began within a week of the time the first atom bomb was dropped on Japan in August of 1945. The U.S. entered the fray in fall of 1950 when North Korea invaded South Korea. 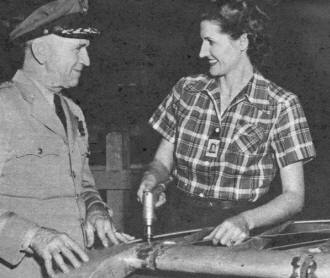 Once again, America's women answered the call to build our instruments of war while sons, brothers, fathers, and husbands went off to fight against Communist aggression in foreign lands. Back in '41 Mrs. Gertrude Threadgill, a San Antonio, Texas housewife, left her kitchen, and held down a production line job at Kelly AFB until '45. In answer to latest call for women workers she's being welcomed back on job by Maj. Gen. Clements McMullen. Total preparedness can't be accomplished by the male half of the people alone. There's a bigger job for the female half than in any previous crisis. No less than 40% of the aircraft production workers during the last war were women. The ratio may be even higher at the next peak of activity. Visit an aircraft assembly line and you will see girls in coveralls busy at every stage as the planes roll toward the doors to the flight line. Closer to the Air Force, hundreds of thousands of Civil Service workers and civilian employees, of course, will be needed for the office work at headquarters and bases. Closer still are those in uniform. In World War I, aside from nurses, there were no women actually on military status except the Navy's few yeomanettes. In World War II, all the services - Army, Navy, Marines, and Coast Guard - began to open their doors to women. It may have been with hesitation that Generals, Admirals, and Congressmen approved the recognition of the uniformed service, disability pay and retirement, as well as the incentive of rank for women. But the faithful, efficient record of the servicewomen have earned these rights for them. Much of this advance was pioneered by air units. From the beginning of the last war, Civil Air Patrol, later to become an auxiliary of the Air Force, gave equal opportunity to men and women. Some women flew on anti-submarine coastal patrol. In 1942 Congress authorized establishment of the Women's Army Auxiliary Corps, which was later changed to the Women's Army Corps. This organization trained women for duty with the Army and the Army Air Forces. In 1948 legislation was passed authorizing integration of women in the Army, Navy, Marine Corps and the newly established U. S. Air Force. At present, the Air Force is utilizing women in the majority of its career fields. 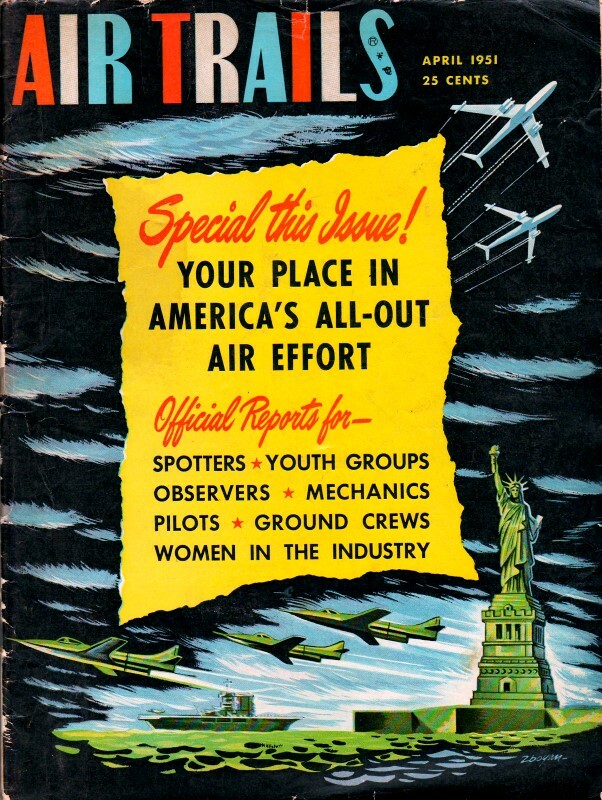 In addition to performing administrative duties, they receive technical training as control tower operators, weather observers, radio operators, radio mechanics, photographers, radar mechanics, parachute riggers, clerk-typists, stenographers, medical assistants, dental assistants, cooks and many other jobs essential to the Air Force. In the first years of the war, the WASPs - Women's Auxiliary Service Pilots - were trained by the Air Force but employed as civilians to fly transport planes and even fast fighters. They ferried new planes for delivery from factories to bases. The director of the WASPs was Miss Jacqueline Cochran, famous aviatrix and business woman, who at the present time is serving as chairman of a board of special consultants to the Air Force Chief of Staff on programs pertaining to all female personnel in the Air Force. Women's work in the last war is likely to seem a small experiment indeed compared with the effort ahead. Complete manpower use is needed - in the services, factories, farms, mines, transportation system, and every useful industry. For the first time, labor will be short even after employing every able man. The answer is women and more women. The strength of the WAF - Women in the Air Force - has been limited to 2% of the total peacetime Air Force strength of officers and enlisted. personnel - barely more than a token force. In the event of full mobilization, a goal of 10% is possible. It could be larger. The Air Force part of the 3 1/2 million planned strength, as of June 30 for all the services is approximately a million, so the WAF complement could be in the magnitude of 100,000 when the bars begin to go down. And the Air Force will continue to grow far beyond its June 30 strength. While official figures have not been revealed for the other women's services, there is no direction to go but up. Enlistment ages for women, in Regular or Reserves, are about the same as for men - from 18 to the mid-30's. Older women who have exceptionally valuable experience may be admitted later. Duties for many of the girls in uniform will be much as they were during the last war. But the Air Force offers a wide variety of specialties - from flight dispatching to aircraft engine overhaul - in strickly aviation jobs. The Author, Col. May, is Director, Women in the Air Force (WAF) and the first to hold that position. A former personnel head, she was commissioned from first officer candidate class of the WAAC in WW II.